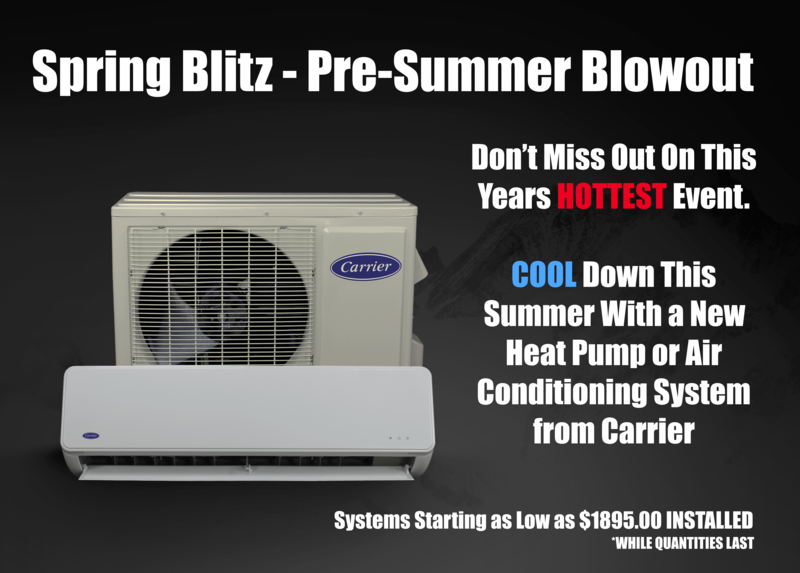 CARRIER IS HAVING A PRE-SUMMER BLITZ ON COMFORT SERIES DUCTLESS A/C AND HEAT PUMP SYSTEMS. 9,000/12,000/18,000/24,000BTU SINGLE ZONE SIZES AVAILABLE. Extended Warranty Available: 5 or 10 Year Labor warranties available for purchase. Call (902) 483-6592 TODAY… LIMITED QUANTITIES AVAILABLE, DON’T MISS OUT! Atmosphere Climate Control Specialists Ltd.
Great experience with Atmosphere. They certainly live up to the great reviews and experiences that everyone has been describing. We look forward to staying cool this summer with our new Carrier heat pump. They are a bit more expensive than some of the other competitors that we had other quotes from but the quality of the Carrier system and the expertise of Cory and his staff is worth the investment. Great team. Just had our old Goodman heat pump replaced with a Carrier Greenspeed system. Atmosphere was prompt, polite and offered insight and details that the other contractors didn't seem to be capable of. They offered us several heat pump options to choose from, but in the end we decided to go with the top of the line heat pump to get the best benefits. Would certainly recommend Atmosphere to anyone that is considering a new heat pump system in Halifax. Great bunch of guys. Happy with our new Carrier Heat pump. Splendid experience, looking forward to years of comfort from our new Carrier heat pump. Wicked !!... these guys are honest and know their stuff. Probably one of the best if not the best experience with a trades contractor in my life. Don’t cheap out on Chinese garbage or local companies that are just looking to make a quick dollar selling you something you don’t need. Hire and expert heat pump company like Atmosphere and get the job done right !. Thumbs up ! Almost got ripped off by Sunshine Renewable because they made the wrong suggestion for our home. Atmosphere came and suggested we utilize our existing furnace for a new heat pump system where as Sunshine wanted to push mini splits on us. BUYER BEWARE, not all heat pump contractors know what they are doing!. We love our new Carrier heat pump system and we thank the group at Atmosphere for getting it right ..
Great group of people, do your research and get a Carrier, it’s a bit more money but you get what you pay for. Check out the GREENSPEED. FANTASTIC!!... there needs to be more companies like Atmosphere in the world. Didn’t try to sell me something I didn’t need and took the time to go over all the options and pick the best one for our home. Carrier has the best systems in the world and we didn’t even know about them until Cory and his team came and installed ours - HIGHLY RECOMMEND !! Fantastic small business to deal with, friendly, prompt and courteous to our needs. I contacted Atmosphere for an emergency repair for a rental we have in Halifax. Since we live in Quebec we have to rely on honesty of the people we hire to take care of our rentals when we are away. Great, honest and reasonably priced. Highly recommend. Had these guys in to give us some ideas and prices for a new ductless heat pump system. We are BLOWN AWAY!!!. Cory was fantastic, he suggested things that made more sense than any of the 3 companies we contacted. We were misled by one company who sold Fujitsu and told us they had the most efficient system available when in fact the Carrier Infinity system that Atmosphere sold us is by far the most efficient !!... do you research and if I were you I would purchase from Atmosphere!! Tanner and Cory were AMAZING! So knowledgeable, friendly and helpful. Also quick to respond and give an actual appointment time and not a 4 hour window. Arrived on time and texted when they were on their way. Excellent service! Excellent service. Very efficient business. Installed on time and the cost was as quoted. Helped me process my rebate application. After installation service was prompt. Great service and very satisfied with my heat pumps. Saved me over $400 on my power bill!! Have used this service from the time we built, always professional and do a great job. We spoke to 6 separate heat pump contractors in Halifax about a new system for our home. Atmosphere came in and assessed everything and sold us a new Carrier system that is quiet, efficient and reasonably priced. The installation was professional and timely and we have nothing but good things to say about the entire process. Great team at atmosphere. Fast, friendly service. In depth, informative, professional install. Highly recommend! Everyone we dealt with at Atmosphere was exceptional. Cory was very thorough and patient and anwswered all of our questions. The technicians were also very knowledgeable and professional. They even accommodated our babies’ nap time! The systems Atmosphere sells are fairly priced and so far we have had a warm house and no issues. Lastly, they were able to install a new system within a week which was extremely important since our old system was no longer functional and it was the middle of winter. Thanks to the Atmosphere team! I am so pleased with the recent installation I had done by Atmosphere. Cory was very informative and gave me a lot of useful information in choosing what system I should install in my home. It can be overwhelming to make these decisions on your own and I appreciated his time and knowledge and couldn’t be happier with the experience. 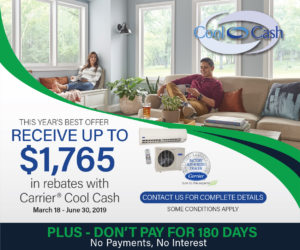 The Carrier heat pump I chose is working great and I would certainly recommend them to anyone looking for straight forward answers and a trusty, polite crew of technicians. Workers were on time and very professional. They were very quick to respond when my heat pump died at 6 in the morning. They had parts flown in and installed within 1 business day. Very professional and friendly. Would highly recommend. Incredible service, timely, affordable and reliable. Amazing sales personal. Very polite and professional would recommend to anyone. We are so happy with our new heat pump! Excellent service and quality work. Colin and Tanner were wonderful. We highly recommend Atmosphere Climate Control! Fast, friendly service. Cory had our heat pump up and running smoothly again in no time. Highly recommended! I have never given anyone a review and usually my good experiences are mediocre at best but my experience with Cory and his team at Atmosphere were unreal... and I mean UNREAL!... smart, honest and they really know there stuff. We bought a new Carrier Greenspeed system to replace our 3 year old Daikin system that just kept giving us problem after problem, we found out that Daikin is actually a Goodman heat pump with Daikin branding and NOT what we expected when we originally purchased it. BUYER BEWARE. We highly recommend both Atmosphere and Carrier to anyone who is looking to have a professional, honest and great customer service experience. I did what any homeowner should do and had several contractors come to our home and give us a quote for a new heat pump system in our home. The first one was Heat Pump Guys... I don't have anything good to report from my experience with them, they were slow to call us back and when the sales person finally did come they couldn't answer our questions about warranty and after installation service which was our biggest concern. The second company we had come and see us what Sunshine Renewable Energy; their sales person was the least knowledgeable and we just felt that he was more concerned with selling us whatever he could to just grab a quick sale and move on to the next sales call. We also had Halifax Heating and Presidential Ventilation give us a quote. We looked into the Daikin heat pump lineup and found that their systems do not operate below -15C and their warranty seemed a little convoluted and when we questioned the sales person on this he was hesitant and clearly seemed to be hiding something from us so we opted to not pursue them either. Cory came on a Saturday morning to see us because my husband works M_F until 6 and Cory wanted to make sure we were both present for his list so he could answer ALL of our questions and provide us with the best options. He was on time, extremely knowledgeable on both the systems he sells as well as the other brands on the market, he explained to us how the Carrier heat pump warranty works and gave us several options that fit with our budget. The new Carrier Infinity heat pump system we had Atmosphere install is working flawlessly and we even have better heat in our home since our old clunky oil furnace was making us sick and killing our monthly expenses. Thank you to Cory and his team and exceptional technicians. This company has a lot of integrity and the guys are very kind and courteous. HIGHLY RECOMMEND!! These guys were great, showed up on time and even went out of their way to help my pregnant wife move all the stuff we had blocking the furnace in. Good, respectful men they have working for them.. The team at Atmosphere is phenomenal! The owner, as well as his employees, showed us great respect and we're genuinely interested in our issues and helping us out . Their work was done efficiently and professionally and I honestly couldn't see my wife and I going with anyone else. Big thanks to the team and all their hard work. Cory and his team were amazing to work with. very professional and explained every step of the way. responded quickly whenever questions came up. It's so nice to know some contractors are still professionall, show up on time, work clean and organized , and actually FIX the problem. We had 4 other companies come and inspect our poorly installed heat pump system and it wasn’t until Cory showed up with his team that we learned about all the errors that the other companies had missed. The system wasn’t installed to code, the electrical wires were too small, the ducting was too small and the heat pump was almost 1/2 the size it should have been!! !.We decided to contract Atmosphere to take out all of the old system and install everything new and fresh with an upgraded Carrier GREENSPEED system. Much MUCH better now that we have the new system up and running.Thank you so much to Cory and his team of great young men, top notch ! Excellent and professional service. They were able to diagnose the problem quick and efficiently. Reasonable prices. Couldn't be more satisfied. Would recommend them to others. Contacted Atmosphere Climate Control for an estimate on a heat pump installation upon seeing that they had a 5 star rating from their previous reviews. I understand why they are rated as 5 star, as they were quick to provide an estimate, took the time to explain what type & size heat pump I needed for the size of my house. The technicians that installed the system were professional & took the time to explain all features of my new heat pumps. I highly recommend Cory & his team; he was even able to save me money over other companies & offers the same warranty. We live an hour outside of Halifax and were looking for several quotes on replacing our Carrier heatpump system. Cory provided us with professional detailed options and returned our calls and texts in a very prompt matter. We are very pleased with our choice of unit and especially with the service provided with Cory and his team. We would highly recommend them to anyone out there looking for heat pump options. Our Carrier 16 seer unit is very quiet, quickly cools or heats the house beyond our expectations. By far the best company out there..They not only I stall and are great for service but will actually take the time to educate customers on the products..very fair prices..completely satisfied!!!!! Had these guys in to install a new carrier ductless heat pump for us this week. AMAZING! Is all we have to say. Great job by Tanner and Cory, we are loving the heating for our new downstairs rec-room and the other two systems in the house. Cory took us through all the Carrier options and showed us how Carrier is hands down the most efficient and overall best heat pump product for our climate. No lies, no tricks just some real, old fashioned trades guys doing what they do best. Do your homework and go with the guys that are actually trained and licenced to do this type of work. Thanks again guys ! Great response and very professional service. Tanner and Cory stayed to finish the job and offered some great advice! Absolutely amazing small business to deal with. We had several heat pump contractors in to assess our home and none of them could answer our technical questions or give us the solutions we were looking for until we came across Atmosphere. Cory really knows his stuff and he takes the time to make sure you’re getting what you need and want for your home. No sales pressure, no lies and the installation crew was fantastic. From the sales to the installation and after installation administrative experience this company deserves an award for the BEST CUSTOMER SERVICE, if I could give 6 stars out of 5 I would. Thank you Cory and your fabulous staff for making our renovation a lot less stressful. Cory came out and gave great service. I was impressed with how much he knew about my Lennox system. He helped me with my remote controlled thermostat and I couldn't be happier. I will definitely be getting Atmosphere back again! Big thanks to Tanner for coming out and checking over our heat pump today. He’s the man! Cory also came to look at the possibility of adding another Carrier system to our basement. They were very helpful and friendly guys. All the guys from Atmosphere have been great! Thanks again! After inviting several companies to address an issue I had with my heat pump and being told by 2 that I needed an entirely new system, I called Atmosphere and spoke to Cory. He came over the day after my call and it took him precisely 2 minutes to assess the problem and solve it - he added refrigerant. Today I had a leak in the heat pump room and he sent Tanner over immediately and again solved the problem in a heartbeat, with NO CHARGE!! If you want a reliable, respectful, professional company with integrity and pride in what they do, call them. Thank you for restoring my faith that there are actually companies out there who don't want to rip you off. Thank you! Incredible service, fixed the heat pump quickly and were super friendly. Thanks!! We've had Atmosphere come to our place twice now and they have been a huge help. They are very focused on ensuring the costumer is happy with the service and they go out of their way to be flexible! Cory and the atmosphere team are fantastic - I cannot say enough good things about these folks. We have needed service twice, and both times they were friendly, helpful & accomodating. Anytime I see a friend who has a heat pump, I am always sure to recommend atmosphere given their incredible service. You can call at 10pm and they still pick up and get someone to contact you the next day for an apt!! If you have heat pump trouble, these are the folks to call! We had Cory and the team at Atmosphere install a Carrier heat pump system in our home a few weeks ago and it’s been fantastic. The system works great (house stays very cool all day), the price was reasonable and it was installed to meet our specific needs. Cory was great at answering all our questions, and was reachable by email which was convenient for us. Highly recommend Atmosphere, thanks again! Amazing service!! We love our heat pump and have nothing but rave reviews for the team at Atmosphere. Cory was super helpful and went above and beyond. These guys showed up when they said they would, they diagnosed the problem, ordered the parts, and got my heat pump running again. I know that's the way it is supposed to happen, but so rare these days. If you want prompt service, polite technicians, and fair billing , call them. We were having issues with our heat pump, so we called up these guys to assess the problem. Cory was a great help, and was great at diagnosing the problem. Texting back and forth was awesome and made things real easy too, as we were able to figure out some preliminary issues before having to schedule a full service appointment. Overall, great communication and best service we've had! Cory provided amazing service at the end of a very long hot day. He got our heat pump up and running and was courteous and incredibly professional. Cannot recommend enough. Thank you! Excellent service! Atmosphere helped us out of an uncomfortable situation on a Saturday morning and then followed up with necessary maintenance. Cory was very knowledgeable and professional. Highly recommend. Thank goodness we still have reliable company’s such as Atmosphere Climate Control Specialists! Cory was able to assess the problem, search for the part we needed, have it shipped in and was here the very next morning to fix it. Communication was on point and that means a lot to us. I want to thank Cory once again from Atmosphere!!!! Cory installed a new Carrier heat pump and a new humidifier for my house. The product has been performing very well. I am very satisfied with the product. He and his team member are very professional and easy to communicate with. Overall I am very happy with their work and feel I definitely made the right decision to choose this company. I am looking forward to have them maintain my unit in the future. Great customer service! Good work! We lost use of our old heat pump, our only heating source, two days before christmas. Despite calling numerous companies, including a company who had serviced our old heat pump one year prior, we were told either that they were too busy and couldn't help or that it would be two weeks before we could expect to have someone even look at our system. When we called Atmosphere and explained we had no heat, Cory was at our place within an hour and within two hours had our old system back up and running. We eventually had Atmosphere replace our old system which has reduced our heating bills by 50%. Since the installation Cory has also followed up periodically without any prompting just to make sure we were happy with everything, to confirm that the new system is running properly, and to ask if we need any help operating the new system (of which the new system has been incredibly self sufficient). I really can't say enough good things about this company from the customer service, quality of product, and workmanship for the installation. Awesome small business to deal with. They’re honest, professional and sell great products. We had them replace our Goodman heat pump with a Carrier Greenspeed... Wow what a difference. We hired Atmosphere to install our Carrier heat pump system. After reviewing several other contractors we were all set to go with a new Daikin heat pump when we saw the news about their misleading warranties and we also found out that they don’t transfer any remaining warranty if we sell our home, yet they pride themselves in having the best warranty in the business #buyerbeware.We are very happy with our new Carrier system and Atmosphere was an absolute dream to work with. Do your homework and ask lots of questions, these heat pump contractors are a little crooked. Great contractors. 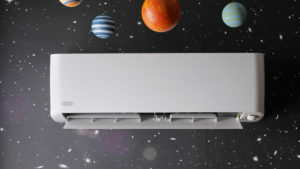 We had a new Carrier ductless unit installed and they gave us a better system and a better price than most contractors. Also, very professional and extremely knowledgeable. Just had these folks in this morning to take a look at our Daikin central heat pump. We had seen on the Halifax news that heat pumps have been known to cause mold issues and we wanted ours checked out. They did find MOLD !!! . We had a UV light installed this morning and are waiting on our new Air Purifier that they will be installing next week when it arrives. Very polite, knowledgable and organized. HIGHLY recommend. Went above and beyond - some of the best service we've ever had. We will be customers for life I think. Thank you! We hired Atmosphere for a second time and we are happy with the service. We needed a new heat pump system, split, ductless style installed in multiple rooms of our house. We used them to help us with our investment property as well. I asked a lot of questions, some were pretty dumb but they were very helpful. Not only were they professional but they were very patient. We went through a few options - I was honestly quite annoying about it because I wanted to learn all our options but they were overall very helpful and informative.We will be using them again as we need new hvac systems in multiple properties.Hats off and hands down the best heating contractor in Halifax! We recently had a major heating issue at one of our rental properties. I was not only thoroughly educated on what the issue was and how it happened, but the repair was done faster than promised and I feel like the price I paid was well worth it. Thank you again for handling things so well. Hands down the best HVAC company in Halifax , they know their stuff and are just a great group of people. We had 2 great guys , Cory and Justin come on Friday to install a new Carrier heat pump system and we were totally impressed by their professionalism, and the way they worked and were always available for questions. We used their recommended electrical contractor for our panel changes and again, very professional and cleaned up very nicely after themselves too! I'm so very happy with all the service we've had from Atmosphere. They follow up, do what they say they will, when they say they will, and are just fantastic. I totally recommend them. Justin was courteous, efficient, and very pleasant. He arrived on time, called to let me know he was on his way, and explained what he would be doing as part of our routine warranty maintenance. He also quickly found the source of a minor rattle (turned out to be a loose fin on the duct in the hallway), and made sure it was fixed before he left. Very pleasant and professional. We have been very pleased with all of Atmosphere’s personnel and highly recommend them. I was having an issue with my thermostat communicating with my heat pump and furnace. Cory was very knowledgeable and quick to diagnose the issue. A great customer service experience. Highly recommend. Super fantastic service. Prompt and professional. Made sure I've got heat in time for the holidays. We had the heat pump unit in our home replaced with a new unit we purchased through Atmosphere. Justin and Jeff were the technicians who performed the install. They both worked very hard and did a great job making sure everything was done right and woking properly. They were polite, courteous and knowledgeable and truly lived up to the company's reputation for quality service. We purchased a renovated house and found big discrepancies between the temperature on all three floors. My daughter had used this service so I invited Cory to give us a quote. We went ahead with the process and had them install a zoning system that would provide separate heating for each floor!!. We found him to be extremely knowledgeable and totally honest. He showed up on time several weeks later as planned and completed the job in a few days. We have been very happy as he showed us how inefficient our duct system was with air leaks etc. I would be my pleasure to refer Cory to anyone in our situation, big house, bad distribution of air flow. My wife and I have never had such great service they figured out what the problem was and fixed it and was very professional... Just wanted to say thanks again! They have always been so quick to fix any issues we have. Every single one of their employees has been courteous and kind and is always there for my family and I. These guys were prompt and reliable, and when we had a small issue they stood behind their work and made it right! We did a home renovation 4 years ago and installed a 3 zone heat pump using a different company. From day one, we had static pressure issues, uneven heating/cooling, system faults, etc. The original company was in and out for a year without results. A few months ago the motor in the 4 year old unit went out... luckily we found Atmosphere. They quickly ordered and installed a new motor to restore heat to the home. They also highlighted that the failure was likely caused by constant and ongoing excess pressure in the system due to the supply ducting. Cory and Justin spent some time with me discussing options and came up with a bypass damper system idea. They installed that and, in addition, a whole home humidifier. Immediately, our system was working as it should. Excess static pressure was gone. Airflow in all three zones improved immediately. The backup heat came on much less and the system had no more errors. It was finally working the way it should have 4 years ago!!! Their knowledge, service level and expertise were stellar. It was the happiest I have been to spend my hard earned dollars because they finally solved all of the heating issues in my home that others couldn't. I just wish I found them 4 years ago!! I can't recommend them enough. Fantastic, prompt and professional service and advise on our improperly installed heat pump that we purchased from another contractor.